Many older women depend on income from Social Security benefits. 1. Can I Draw on My Divorced Husband's Social Security Benefits? 2. Can I Collect Social Security Benefits From Two Deceased Husbands? The U.S. Social Security program, funded primarily through payroll taxes, provides financial assistance to people who have retired or become disabled. Benefits are also paid to the worker’s surviving spouse, children and ex-spouse. Because women generally have lower lifetime earnings than men, Social Security is often one of few sources of income for older women. Social Security benefits kept approximately 38 percent of older women out of poverty in 2010, according to the AARP Policy Institute, and more than one-fourth of older women count on Social Security payments for nearly all of their income. Workers who pay Social Security tax earn credits toward their future retirement benefits. People born in 1929 or later must have 40 credits, equal to 10 years of work. Benefits depend on retirement age and how much the worker earned. Those who take early retirement at age 62 will receive lower benefits than if they had waited. Continuing to work beyond retirement age adds to the worker’s earnings record. 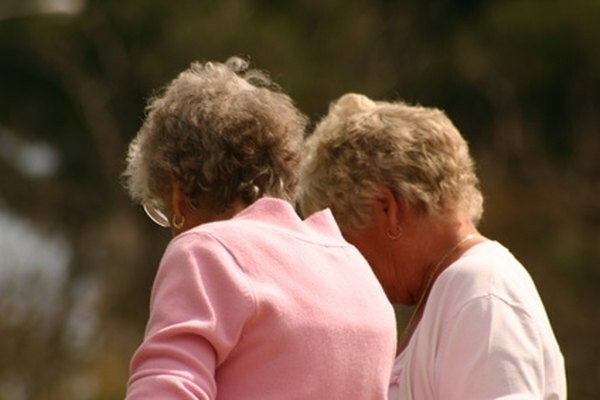 Wives who are 62 or older are eligible for Social Security retirement benefits. Younger wives are also entitled if they are caring for a child who is younger than 16 or disabled and entitled to benefits on the father’s record. A married woman who never worked or who has low earnings can be eligible for as much as half of a retired worker’s benefit. When a married woman has worked and accrued her own record, she is eligible for both her own retirement benefits and spousal benefits. If the spousal benefits are higher than her own benefits, Social Security pays a combination of benefits that equals the higher amount. Ex-wives who are 62 (age 60 if the husband is deceased) or older are entitled to benefits on their husband’s record if the marriage lasted at least 10 years and the ex-wife is single. She is eligible for benefits based on her ex-husband’s work record if that amount is higher than the benefits she would receive on her own record. She can receive spousal benefits of 50 percent of her ex-husband’s benefits. If the former husband dies, his ex-wife is eligible for widow’s benefits that could be up to 100 percent of her husband’s full benefit. The amount the ex receives does not affect the amount of benefits the husband receives or the amount a current wife receives if he remarries. If the ex-husband has not applied for benefits but is 62 or older and eligible, the former wife can apply if they have been divorced for at least two years. If the ex-husband is deceased and the former wife is caring for their child who is younger than 16, or disabled, she can receive benefits at any age. A woman who has been married more than once for over 10 years each time and then divorced can collect on the higher earnings records of each ex-spouse. A wife can’t receive a spouse’s benefits unless her husband has filed for retirement benefits. However, if the husband is at full retirement age, he can apply for benefits and then ask that the payments be suspended. Thus, the wife can receive a spouse’s benefit while the husband can earn delayed credits until he turns 70. A married or divorced woman who has reached retirement age can choose to receive a spouse’s benefits while continuing to acquire delayed credits based on her own record. Then she can file later and receive higher benefits. Wives and ex-wives can apply for retirement benefits at a local Social Security Administration office or online. The woman should be able to provide the spouse’s Social Security number or the date and place of his birth and the names of his parents. Social Security: How Do You Qualify for Retirement Benefits?